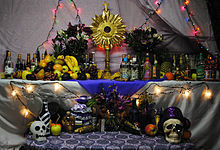 Vodou altar celebrating Papa Guédé in Boston, Massachusetts. It has offerings to Rada spirits, to the Petwo family, and to Guédé. The gold object in center is a monstrance. Folk Catholicism is any of various ethnic expressions of Catholicism as practiced in Catholic communities, typically in developing nations. Practices identified by outside observers as folk Catholicism vary from place to place and sometimes contradict the official teachings and practices of the Roman Catholic Church. How folk is defined will influence whether the expression of Catholicism in a given area is defined as folk Catholicism. In general, when aspects of folk religion intermingle with Catholic beliefs in an area folk Catholicism will result. Some forms of folk Catholic practices are based on syncretism with non-Catholic beliefs and may involve the syncretism of Catholic saints and non-Christian deities. Some of these folk Catholic forms have come to be identified as separate religions, as is the case with Caribbean and Brazilian syncretisms between Catholicism and West African religions, which include Haitian Vodou, Cuban Santería, and Brazilian Candomblé. Similarly complex syncretisms between Catholic practice and indigenous or Native American belief systems, as are common in Maya communities of Guatemala and Quechua communities of Peru to give just two of many examples, are typically not named as separate religions; their practitioners generally regard themselves as good Catholics even while worshiping non-Christian gods. Other folk Catholic practices are local elaborations of Catholic custom which do not contradict Catholic doctrine and practice. Examples include compadrazgo in modern Iberia, Latin America and the Philippines, which developed from standard medieval European Catholic practices that fell out of favor in Europe after the seventeenth century; the veneration of saints and angels that are not officially recognized by the church; and pilgrimages in medieval and modern Europe. Modern folk Catholic beliefs and practices include miracle stories about priests in Ireland, stories about apparitions of the Virgin Mary and other saints in Spain, and folk practices surrounding vows to saints in Latin America and Europe. Folk Catholic practices occur where Catholicism is a major religion, not only in the often-cited cases of Latin America and the West Indies. Folk accommodations between Catholicism and local beliefs can be found in Gaelic Scotland, the Philippines, Ireland, Spain, Portugal, France, Italy, Poland, and southern India. The Roman Catholic Church takes a pragmatic and patient stance towards folk Catholicism. For example, it may permit pilgrimages to the site of reported apparitions (e.g. Međugorje) without endorsing or condemning belief in the reported apparitions, and will often declare Marian apparitions and similar miracles "worthy of belief" (e.g. Our Lady of Fatima), or will confirm the cult of local saints without actually endorsing or recommending belief. When the Roman Catholic church considers that there is a blatant heresy occurring, it actively rejects it and tells Catholics to stay away from such practices. This is the case of the cult of Santa Muerte (Saint Death, a personification and worshiping of death). The church has condemned the cult as blasphemous, calling it a "degeneration of religion". ^ "'Saint Death' Comes to Chicago". Chicago Tribune. Retrieved 8 September 2016. ^ Garma, Carlos (10 April 2009). "El culto a la Santa Muerte". El Universal (in Spanish). Mexico City. Retrieved 8 September 2016. ^ "Vatican Declares Mexican Death Saint Blasphemous". BBC News. 9 May 2013. Retrieved 8 September 2016. Allen, Catherine (1999). The Hold Life Has: Coca and Cultural Identity in an Andean Community. Washington: Smithsonian Institution Press. Badone, Ellen, ed. (1990). Religious Orthodoxy and Popular Faith in European Society. Princeton, New Jersey: Princeton University Press. Christian, William A., Jr. (1981). Apparitions in Late Medieval and Renaissance Spain. Princeton, New Jersey: Princeton University Press. Johnson, Paul Christopher (2002). Secrets, Gossip, and Gods : The Transformation of Brazilian Candomblé. Oxford: Oxford University Press. Nutini, Hugo (1984). Ritual Kinship: Ideological and Structural Integration of the Compadrazgo System in Rural Tlaxcala. Princeton, New Jersey: Princeton University Press. ——— (1988). Todos Santos in Rural Tlaxcala: A Syncretic, Expressive, and Symbolic Analysis of the Cult of the Dead. Princeton, New Jersey: Princeton University Press. Taylor, Lawrence J. (1995). Occasions of Faith: An Anthropology of Irish Catholics. Philadelphia: University of Pennsylvania Press. Reyes, Dominic; et al. (2013). Folk Catholicism in Iligan City. Iligan, Philippines: MSU-Iligan Institute of Technology. Vergote, Antoine (1982). "Folk Catholicism: Its Significance, Value and Ambiguities". Philippine Studies. 30 (1): 5–26. ISSN 2244-1638. JSTOR 42632594. Retrieved 21 July 2018.